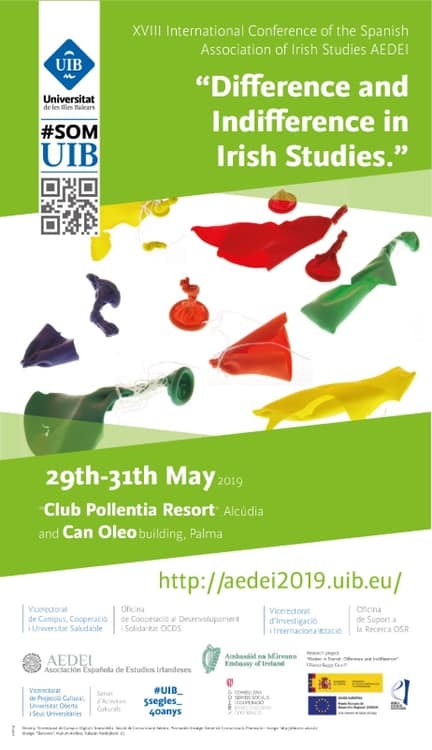 The Organizing Committee of the “18th International Conference of the Spanish Association of Irish Studies: Difference and Indifference”, to be held in Mallorca in May 2019, is pleased to announce that the deadline for abstract submission has been extended to 15 February, 2019.
affective and political response that may be interesting to appraise in relation to its double meaning, as referring to lack of “affective solidarity” (Hemmings 2012: 157); and to the assimilation of difference mainly through its cooptation by dominant neoliberal discourses, which in no way alter or erode the unequal power hierarchies imbued in its operations. We welcome proposals for twenty-minute papers coming from varied academic disciplines (Literature, Media and Film Studies, Drama and Theatre Studies, History, Sociology, Political Science, Philosophy, Linguistics, etc.) and theoretical approaches (Cultural Studies, Feminist and Queer Theory, Postcolonial and Decolonial Studies, Globalization Studies, Eco-criticism, Animal Studies, Affect Theory, etc.). 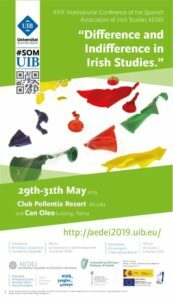 Abstracts of no more than 250 words for twenty-minute papers should be sent to: AEDEI2019@uib.cat by 15 February 2019. This four-star hotel is located in the North of Majorca, between Alcudia and Pollença. • Bodies in Transit: Difference and Indifference (FFI2017-84555-C2-2-P). Ministerio de Economía y Competitividad, FEDER. • Literaturas Anglófonas Modernas y Contemporáneas (LITANGLO). The organizing committee would like to express their gratitude for the generosity of Vukasin Nedeljkovic, who has allowed us to use the pictures of his series “Balloons”, integrated in his project Asylum Archive. This project’s objective is to collaborate with asylum seekers, artists, academics and activists, amongst others, with a view to creating an interactive documentary cross-platform online resource, critically foregrounding accounts of exile, displacement, trauma and memory. It is an act of solidarity to bring a different perspective on the life of people who came to Ireland to seek protection. His recent book Asylum Archive, a unique and essential publication in making the reality of Ireland’s Direct Provision system public, can be accessed here.